As a naturopathic doctor, I commonly recommend nutritional and herbal supplements to my patients, and when I do, I am particular about both the brand and exact product. The quality of the ingredients, as well as the processing and handling of the product, can make the difference of whether a product is effective or not. Supplement companies have many decisions to make with their product: the way they label their ingredients, the delivery form they choose, the type of nutrients and the plant parts they include, just to name a few. These decisions make a significant impact on the quality of their product, as well as provide insight into how knowledgeable the individuals formulating the product are. It can be challenging (and overwhelming) to go supplement shopping as there are so many options. It is very common to purchase supplements through sites like Amazon. However, it is impossible to know where the supplements came from, how they have been stored. The purpose of this blog is to take some of the guesswork out supplement shopping and to help you become a savvy, supplement shopper. Wheat, Lactose: Watch carefully for these if you have a wheat and dairy intolerance/allergy. There is also a concern that this ingredient has a GMO source. Magnesium stearate: There is a concern that the source of this ingredient is a GMO. This can bind to the active ingredients and prevent absorption. There is some evidence that this negatively impacts the Natural Killer cells of your immune system. Hydrogenated oils: These contain trans fats which are detrimental to your cholesterol and blood lipids, which increases the risk of cardiovascular disease. Talc/Magnesium Silicate: This is a cheap filler which can have detrimental effects when inhaled, and has also been speculated to increase the risk of stomach cancer. Carrageenan: This thickening agent can cause inflammation in the digestive tract and worsen IBS, Crohn’s and Colitis. Potassium Sorbate: This is a preservative however it may cause digestive upset and nausea. Silicon dioxide: This is the main compound in sand and rocks. It will not be absorbed and is therefore, less of a concern. Parabens, Benzoates, Sorbates, Sulfites: These synthetic preservatives are used to prolong the shelf life of supplements, yet can cause harm. Beware of these additives as there are concerns of hypersensitivity, allergy, asthma, hyperactivity, neurological damage and cancer. Gelatin: Supplement lines with products using gelatin capsules are likely cutting corners in other areas of quality control, and their use of gelatin is a good tell. People who buy supplements are often a more health-conscious subset of the population; this includes a significant proportion of vegetarians and vegans. Given that this group does not consume animal products, they would not purchase a supplement with gelatin, which is made from the skin, bones and connective tissues of animals. Supplement companies that are comprised of knowledgeable, quality focused people, and who produce top of the line supplements, gear their products to suit the vegan and vegetarian population, since they make up a large proportion of their clients. Therefore, they would never use gelatin capsules in their products. Titanium dioxide: This will color the supplement white. The most prominent concerns are a possible carcinogenic effect, as well as kinder damage. Artificial colors: These colors have no health purpose and have been linked to attention and hyperactivity issues in children as well as intolerances and allergies. You may be wondering why some herbal supplements that have very similar ingredients, yet are very different in price. Supplement companies are businesses, and in some cases, they allow quality to be sacrificed for the benefit of the bottom line. There are two key signs you can look for to tell if the herbs in the product are high or low quality. Are the herbs organic and non-GMO? The last thing you want is to be consuming herbs that have been drenched in pesticides. What part of the plant is included? When you see a herb listed in the ingredients of a supplement, the part of the plant should be specified. For example, dandelion is a common herbal ingredient however, the root of the dandelion and the leaf of the dandelion have very different actions in the body. The root’s action is on the liver, while the leaf is a potassium-sparing diuretic. If the supplement doesn’t indicate which of the two are used, chances are, whoever formulated the supplement either 1. is not well versed in the actions of herbs 2. used a combination of whatever is cheapest. Organic herb farmers will sell the highest quality, active constituents of the plant at the highest price. 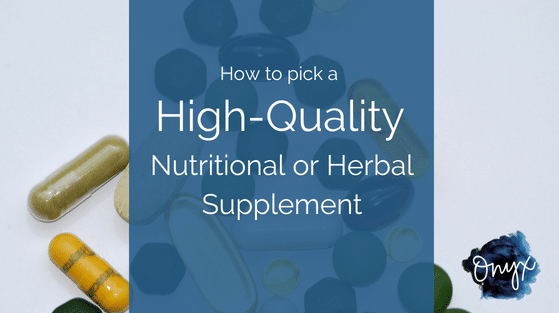 It is no uncommon for low end supplement companies to buy the extras, like the stems or parts of the plant which do not contain the active constituents and simply not specify which part of the plant their product contains. I’m the snobbiest when it comes to fish oil and probiotics. Both are very sensitive to the heat and therefore improper storage can ruin even a high quality product. Probiotics are live bacteria and in most cases they need to be refrigerated to in order to stay active. With fish oils, not all brands are created equal. It is imperative that the fish oils is derived from smaller, wild caught fish such as sardines and anchovies, as larger fish and farmed fish accumulate heavy metals such as lead and mercury! High quality fish oils are more expensive, but they have extensive quality control to test for and remove any traces of these heavy metals. Picking a quality supplement can be a daunting task. If you have any questions on which supplements are right for you, ask your naturopathic doctor as they are the experts in natural medicine.